» Documentación técnica: Contaminación, limpieza e inspección de la fibra. Introducción. Despite industry best practice of inspecting and cleaning fiber optic endfaces, contaminated connections remain the number one cause of fiber related problems and test failures in data centers, campus and other enterprise or telecom networking environments. As the industry moves to higher data speeds, more stringent loss budgets and new multi-fiber connectors, proactively inspecting and cleaning fiber endfaces is more important than ever to ensure network uptime, performance and equipment reliability. Even when users think they have properly cleaned the fiber, every connector endface either field terminated or factory terminated should always be inspected before connecting to a component or piece of equipment. This document covers the tools and techniques for inspection and cleaning of fiber end faces. Every fiber installation relies on proper endface cleaning practices for good reason. Network performance is only as good as the weakest link, and the weakest link is wherever a fiber endface is exposed – whether at a patch panel, equipment port or at the end of a patch cord or jumper. Regardless of the type of fiber, application or data rate, the transmission of light requires a clear pathway along a link, including through any passive connections or splices along the way. A single particle on the core of a fiber can cause loss and reflections, resulting in high error rates and degraded network performance. Contamination on a fiber endface as shown in Figure 1 can also adversely impact the interface of expensive optical equipment, and in some cases even render equipment inoperative. With fiber networks at the core of a business’s most important asset – the data center – and with the need to keep up with consumer demand for high-speed access to information anywhere and anytime, downtime and poor network performance are simply no longer an option. As network applications require more bandwidth and transmission speeds continue to climb from 1 and 10 gigabits per second (Gbps) to 40 and 100 Gbps, loss budgets have become tighter than ever. Dirt, dust and other contaminants are the enemies of these higher-speed data transmission rates over fiber networks. It is therefore critical that all optical connections be kept free of contamination to avoid application performance issues. With contamination being the single greatest cause of fiber failures, spending the extra few seconds to properly inspect and, if necessary, clean every connector endface will save time and money in the long run. While accidently touching a fiber endface and working in dirty, dusty construction environments are known causes of contamination, there are plenty of other ways to mishandle fiber that may not be obvious. Brushing an endface on clothing that can contain body oils, lint or other substances can cause contamination. In fact, any time an endface is exposed to the surrounding environment, it is subject to contamination – even if it was recently cleaned. Dust in the air can easily collect on a fiber endface, especially in the presence of static electricity. Contamination also easily migrates from one port to another every time a connector endface is mated. Even a dust cover designed to protect the fiber endface can be a significant source of contamination. Unfortunately, many users are under the impression that if the endface was previously protected by a dust cover, it must be clean. However, no one can really know for sure what was in that dust cover. This is even the case for endfaces on new factory-terminated connectors. While dust caps are great at preventing damage to the endface, the plastic used to create dust caps can emit a residue as it deteriorates over time and the surface of the cap may contain mold-release substances used in high-speed production processes. Therefore you should not be surprised to find a contaminated endface upon removal of a protective cap on a connector fresh out of the bag. Many also believe that an endface plugged into a piece of equipment must be clean and can therefore be unplugged and remated without concern. However, this too can cause contaminants to pass from one endface to another. Even if the initial contamination was outside of the fiber core, mating can break up a contaminant and cause particles to travel across the endface and redeposit on the core. The same holds true for equipment ports, which are often overlooked as being a source of contamination. It is not enough to just clean every fiber endface. Users have no way of knowing if the endface is clean unless they inspect it using a fiber inspection tool designed specifically for that purpose, such as a professional video microscope or a handheld fiber microscope. That is why the golden rule is to always inspect, and if necessary, clean and inspect again before connecting. In fact, the very act of cleaning the endface can cause contamination. Every endface should be inspected after every cleaning attempt. This is especially a concern for multi-fiber connectors such as the multi-fiber push-on (MPO) style connectors that are rapidly becoming the norm in today’s data center fiber backbone channels as the required interface for 40 and 100 gigabit Ethernet (GbE) applications. Consider a 12-fiber MPO interface with an array that features a much larger surface area than a single fiber connector. When cleaning these larger surface areas, it is much easier to move contaminants from one fiber to another within the same array. And the larger the array, the higher the risk. With 24-, 48- and 72-fiber MPOs used in high-density fiber interconnects, the greater number of fibers are more difficult to control and not all the fibers always protrude at the same height. Height variances across the fibers in a single multi-fiber connector can increase the risk of not every fiber being properly and equally cleaned. There are two main types of inspection tools – optical and video. Tube-shaped and compact, optical microscopes (Figure 2a) allow direct inspection of the end-faces. While these are popular due to their low cost, they don't provide views of end-faces inside equipment or through bulkheads. Video inspectors consist of a small optical probe connected to a handheld display (Figure 2b). The size of the probe makes it excellent for examining ports in hard-to-reach places. A large display easily enables identification of end-face defects. Some provide autofocus and automatic image centering for faster and easier inspection. These probes are also safer because they show an image and not the actual end-face, thereby reducing the risk of exposing one’s eye to harmful radiation. One of industry’s longtime concerns with manually inspecting fiber endfaces has been that determining cleanliness has largely been a subjective and inconsistent process. What one person deems as clean can vary greatly from another. Additional variables such as skill level, years of experience, eyesight, ambient lighting and the fiber inspection tool being used can also lead to inconsistencies in determining fiber endface cleanliness. With more fiber networks being installed and maintained by a greater number of individuals, there is also a greater chance of inexperience regarding what constitutes endface cleanliness. In an effort to establish consistency in fiber inspection and achieve more repeatable results for performance across multiple endfaces, the IEC developed the 61300-3-35 "Basic Test and Measurement Procedures Standard for Fiber Optic Interconnecting Devices and Passive Components." This standard contains specific cleanliness grading criteria to assess pass or fail certification for inspection of a fiber endface, removing the human subjectivity factor. 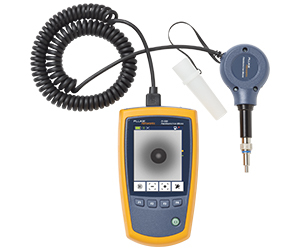 Figure 2b: Fluke Networks FI-500 FiberInspector™ Micro display and probe. 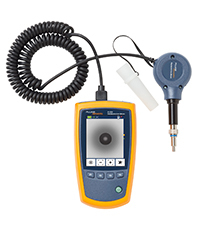 Figure 2c: Fluke Networks FI-7300 FiberInspector Pro MPO / Single fiber inspection camera provides automated PASS/FAIL results and uses Versiv for display, user interface and recording of results. Figure 3: IEC 61300-3-35 grades fiber cleanliness based on the quality and size of scratches and defects in each region of the endface. The certification criteria in IEC 61300-3-35 varies based on connector type and fiber size, as well as types of events: defects or scratches. Defects include pits, chips, scratches, cracks, particles and embedded and loose. Scratches are identified as permanent linear surface features while defects include all detectable non-linear features that can typically be cleaned. 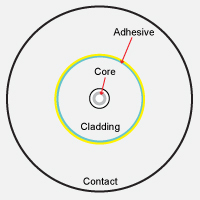 Certification to determine pass or fail is based on the number of scratches and defects found in each measurement region of the fiber endface, including the core, cladding, adhesive layer and contact zones, as well as the quantity and size of the scratches and defects (see Figure 3). For example, as shown in Table 1, multimode fiber with polished connectors can have no scratches greater than 3 μm in width or defects greater than 5 μm in width in the fiber's core. Within the cladding zone, there can be no scratches or defects greater than 5 μm in width, 5 defects ranging between 5 and 10 μm in width and no limit on the number of defects less than 5 μm in width. The number and size of scratches and defects allowed in each zone varies based on the connector type and diameter. While the IEC 61300-3-35 ED.2 standard can be used as a guideline for manually grading cleanliness, a manual procedure would require technicians to determine the size and location of the scratches and defects, which can still introduce human error and inconsistency not to mention take a lot of time. 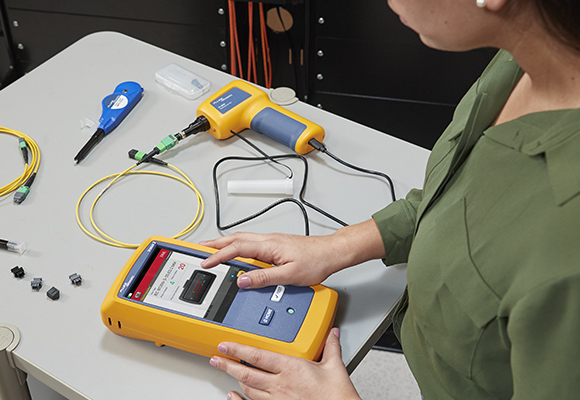 Thankfully, automated certification solutions like Fluke Networks’ FI-7000 FiberInspector Pro use algorithmic processes to automatically and quickly inspect, grade and certify single fiber endfaces based on the criteria of the IEC standard. The FI-7300 can automatically test and inspect both single and MPO end. These types of devices eliminate human subjectivity and result in faster, more accurate and repeatable results to help ensure optimum fiber network performance faces (figure 2c). These solutions also provide documentation of the fiber end face, in the form of images as well as pass/fail results. These results can be stored along with others, such as the loss or OTDR trace for the fiber. Compared to a single fiber, MPO connectors have a more surface area that can collect contaminants. When the connector is unplugged and replugged, particles can move from a spot where they’re not a problem to one where they are. Another thing to keep in mind is that automated inspection of MPOs can take some time – even the fastest systems take nearly two seconds per fiber to generate a pass/fail result – almost a minute for a 32 fiber MPO. That's why an MPO inspection camera that can provide an instant view of the entire MPO connector can save time. The FI-7300's Live View shows the entire connector face in about a second. Then you can use simple gestures to move to a view of the individual fibers. Most of the time, the Live View will let you know if the MPO is likely to pass or needs cleaning. Then you can document it knowing it should pass, or clean it as needed and use Live View again. This saves time waiting for an automated inspection result that is going to fail, but also allows you to catch contaminants that are on the connector but not near any of the fibers. Figure 4: FI-7300 Live View of MPO connector shows you contamination on and adjacent to the fibers. Simple gestures allow you to zoom in on individual fibers. The best answer to the question of what to inspect and clean is everything – every endface should be inspected, and every endface that fails IEC 61300-3-35 certification should be cleaned (see Figure 4). If upon inspection, the endface passes IEC certification, do not clean it. Cleaning can attract dust due to static electricity. Figure 5: Is the endface shown on the left clean or dirty? Automated certification demonstrates that it is dirty per IEC 61300-3-35 due to defects in the core. Any and all endfaces, even brand new ones and factory-terminated plugs and pigtails, should be inspected for cleanliness before mating. That includes both ends of fiber optic test cords, fiber jumpers and pre-terminated trunk cables. If using an adapter to mate two plugs, the endfaces on both sides and the sleeve of the adapter itself should be inspected and cleaned before inserting them into the adapter. Interchangeable adapters used with optical power meters also need to be inspected and cleaned on a regular basis. Often the adapter has a light shield with pin hole that can accumulate debris. Always consult the documentation that came with the testing equipment as some vendors require sending certain adapters back for factory cleaning. When testing or troubleshooting any equipment, including the tester itself, all plugs and ports should be inspected and cleaned before mating. That includes test equipment ports, adapters, test cord endfaces and any ports into which you will be connecting the test cord. As previously mentioned, dust caps and mating can be a source of contamination. Therefore every time a fiber endface is unplugged or removed from a dust cap or port, even when it is brand new, it should inspected and cleaned as necessary prior to being inserted. Ports should also always be inspected and cleaned before inserting a connector, even if one was just recently removed. Properly cleaned end-faces (see Figure 6) can actually “add” up to 1.39 dB onto your loss allowance. In other words, if you have a fiber plant with an overall loss of 5.0 dB against a specified budget of 4.5 dB, cleaning any dirty end-faces may help to drop the link loss down to just above 3.6 dB, providing a “Pass” and plenty of headroom. If inspection reveals that contamination is not removed after dry cleaning, “wet” cleaning will be required using wipes and solvent. Fabric and composite wipes made of lint-free material provide the absorbency to remove contaminants from the endface. In general, it is recommended to avoid cleaning against a hard surface. When using a wipe, typically one or two short (i.e., 1cm) strokes on the cleaning material is sufficient. Enough pressure should be applied so that the wipe can conform to the end-face geometry and ensure that the entire end-face has been cleaned. Figure 6: Clean fiber end-face. 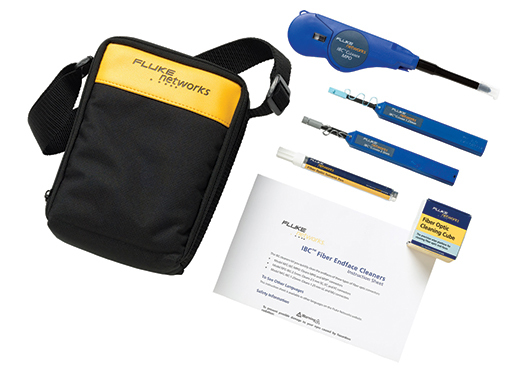 Figure 7: The Fluke Networks Quick Clean™ pens. Using the right solvent with wipes is critical. Solvents add a chemical action that increases the cleaning ability of the wipe to lift particles and debris from the endface while eliminating the issue of static charge with dry cleaning. It is important to avoid using excessive amounts of solvent, which can leave behind a film of dissolved contaminants. To remove excess solvent, wet cleaning should be followed by dry cleaning by either moving to the dry area on the wipe (see Figure 8) or by following up with new dry wipe. Just be sure to not overdo it to avoid creating static charge. The solvent itself should also be specially formulated for fiber endface cleaning, such as Fluke Networks’ Fiber Optic Solvent Pen. While isopropyl alcohol (IPA) was used for many years to clean fiber endfaces, specialized solvents have a lower surface tension that makes them far more effective at enveloping debris for removal and dissolving contaminants (see Figure 9). Such sovents also provide antistatic properties, so dust in the air is less likely to be attracted to the end-face of the connector. IPA can also leave behind a “halo” as it dries that not only causes attenuation, but also can be difficult to remove. No solvent should remain on the endface after cleaning. Figure 8: “Wet to Dry”: cleaning methodology Using a Fluke Networks Optic cleaning card. The solvent drop is placed at "1", and the end face moved across the cleaning material from "1" to "4"
Figure 9: Specialized solvents (left) are far more effective at cleaning endfaces than IPA that can leave behind a residue (right). To wet clean fiber endfaces inside ports or equipment, specially designed lint-free swabs are used instead of wipes (see Cleaning Kits, below). When using swabs for port cleaning, it is important to apply just enough pressure to clean the endface while rotating the swab several times in one direction. When using solvents with port cleaning, it is even more important to not use excessive solvent that can saturate the plug interface. The evaporation rate of a solvent becomes significant with port cleaning as it is harder to guarantee removal of all solvent. Lingering solvent can become trapped during mating and cultivate a harmful residue over time. This is another reason to use solvents that are specially formulated for cleaning fiber–these solvents stay around long enough to work but evaporate much faster than IPA. Swabs may also be used for wet cleaning of MPO connectors. It is also important to remember that these consumables are just that, meaning that once a wipe or swab is used to clean an endface, it should be immediately discarded. Reusing a dirty wipe or swab is one of the easiest ways to spread contamination. While cleaning of jumpers and test reference cord endfaces is important, these components are also consumables that eventually fail-sometimes cleaning is not enough if these components have reached their end of life following the vendor’s specified number of insertions. If network uptime, signal transmission performance and equipment reliability are important to your business, skimping on inspecting and cleaning fiber optic endfaces can result in dire consequences. And just because you may think you properly cleaned, does not mean you can forego inspection. Not only are best practices for fiber cleaning essential, but every endface should be carefully inspected and certified per the IEC 61300-3-35 standard prior to making a mated connection-including both endfaces and ports. By incorporating fiber inspection and certification into your process, you can eliminate human subjectivity and quickly inspect, grade and certify fiber endfaces per the standard. In doing so, there should be no excuse for network failures due to contaminated endfaces. 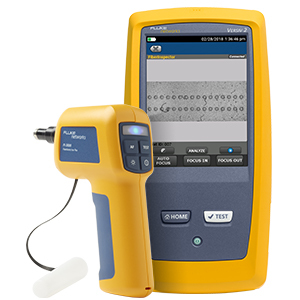 The FI-3000 FiberInspector Pro makes inspecting MPO and single fibers easy and efficient. The multiple camera Live View provides an instant, real-time image with simple touchscreen gestures to view the full connector down to individual end faces. Automated pass/fail results based on IEC 61300-3-35 in seconds. Store results on your phone and share them through text or email or use the industry-leading LinkWare™ to store complete project reports including copper, fiber loss, OTDR and end face images. Compact, ergonomic design with autofocus makes it comfortable and fast even when you’re testing hundreds of cable or ports. 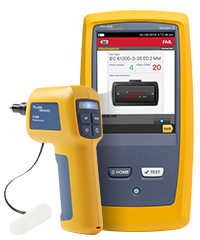 Fluke Networks’ FI-7000 FiberInspector Pro certifies fiber endfaces to the IEC 61300-3-35 industry standard in just two seconds, providing automated PASS/FAIL results that take the human subjectivity and guesswork out of fiber inspection. 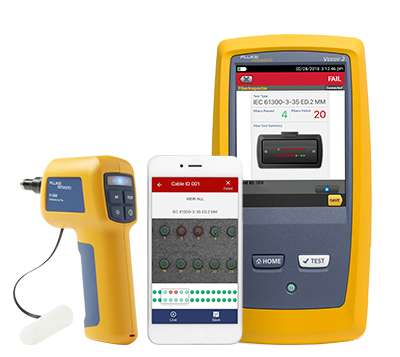 Ideal for inspecting endfaces inside ports or on patch cords, the FI-7000 FiberInspector Pro detects and measures defects found on fiber endfaces and automatically certifies the results based on the IEC 61300-3-35 standard. To provide clear graphical indication of which defects pass or fail the standard’s requirements, the FI-7000’s pinch-and-zoom touchscreen colors each defect and highlights the defect’s background – defects that fail are colored Red while defects that pass are colored Green. Figure 9: The FI-7000’s certification results allow you to quickly determine if the fiber endface pass or fails. An example of a failing endface is shown on the left and a passing endface is shown on the right. The FI-7000 is built on Fluke Networks’ Versiv Cable Certification Platform that enables storing endface images and certification in Versiv test results and taking advantage of Versiv capabilities like ProjX™ for managing job requirements, the Taptive™ user interface for easy set-up and the multifeatured LinkWare Software for managing data and generating professional test reports. The FI-7000’s PASS/FAIL fiber endface certification is available to all Versiv inspection camera owners by downloading the latest Versiv firmware. Inspect all types of installed fiber with the FI-500. The portable fiber inspection tool projects a crisp image of microscopic debris and end-face damage. The patented camera includes PortBright™ to illuminate and easily connect in dark places. Includes handheld color display, auto-focus inspection scope, 4 tips (LC and SC) bulkheads and patch cords (1.25 and 2.50 mm). 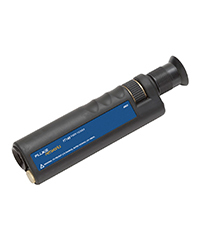 Eliminate the #1 cause of fiber optic link failure – contamination – with Fluke Networks' line of cleaning tools. These kits support all fiber connector types in datacenter and campus environments. Our Quick Clean cleaners are available in 1.25, mm, 2.5 mm and MPO 12/24 and 16/32 sizes for easily cleaning fiber end-faces and ports. For wet cleaning, the solvent pen precisely dispenses a specially formulated fiber optic cleaning solution. Kits also include a handy cleaning cube and easy to use cards for convenient wiping of fiber end-faces, plus swabs for cleaning fiber optic ports. CertiFiber® Pro reduces the cost of fiber certification by two-thirds and features a three second loss measurement of two fibers at two wavelengths. CertiFiber Pro integrates with LinkWare™ Live to let you manage jobs and testers from any smart device over Wi-Fi. The Taptive™ User Interface provides simple, animated guidance to eliminate incorrect reference setup and “negative loss” errors. Future-ready design can be easily upgraded to support Cat 5 to Cat 8 certification, OTDR testing and double-ended Pass/Fail certification of fiber optic connector endfaces. It is Encircled Flux compliant out of the box. Analyze test results and create professional test reports using LinkWare PC reporting software. Fluke Networks’ OptiFiber® Pro is the industry’s first OTDR built from the ground up to meet the challenges of enterprise fiber optic infrastructures. OptiFiber Pro OTDR’s ultra-short dead zones facilitates the identification of fiber patch cords in virtualized data centers. SmartLoop™ technology enables the testing of two fibers in both directions, and averages the measurements as required by TIA-568.3-D in seconds - without taking the OTDR to the far end. Future-ready design can be upgraded to support Cat 5 to Cat 8 certification, singlemode and multimode fiber loss and fiber inspection. Integrates with LinkWare™ Live to manage jobs and testers from any smart device.